Engage a qualified architect who is a member of the Royal Institute of Architects of Ireland. He will carry professional indemnity insurance, he will prepare contract between you and your builder. For small domestic works a short form of contract is available from the R.I.A.I. SF88, it sets out the essentials and protects all parties to the contract, in simple language. Preparation of detailed drawings and tender documents will tie down the price at tender stage. Make your mind up on the detail / finishes etc. before work commences, this approach will eliminate unforeseen extras during the build. Have fortnightly meeting on site to review progress and be advised in advance of any issues arising that might need your attention, record same / take notes. Agree payment schedule in advance to correspond with stages of work through to completion. Choose a good builder, do some research; ask friends, your architect can also advise in this regard. Consider use of high levels of insulation, solar panels, heat pump, consider stoves rather than open fires, ask your architect. Check out grants available from Sustainable Energy Ireland. A Building Energy Rating is required for all new homes or where buying or renting. This is essentially a means of rating the energy efficiency of your home (proposed or existing) on a scale measured from A to G, with A being the most efficient. Your lending agency will require your architect to certify that the works are properly executed before releasing funds to pay the contractor. Ensure you understand the terms of the loan taken out, banks will generally withhold a percentage of the agreed loan until full completion is reached, read the small print. Often landscaping is not completed and or the entrance to the public road or the effluent treatment systems might not be as planned or may not be complete. All works need to be complete to allow a certificate of compliance to issue before the bank releases the final payment, comply fully with all conditions of your planning application. The most important element is design. Good design will take time, to achieve the extension or light filled home of your dreams do not rush the design process, a few weeks extra effort here is well rewarded and avoids regrets and ultimately is cost saving. Look ahead 10, 20, 30 – 50 years, will your home meet your changing needs as you and your family grow older. It’s free ! orientate to avail of solar gain. Even if you choose to go the self build route engage a qualified architect for a preliminary consultation. 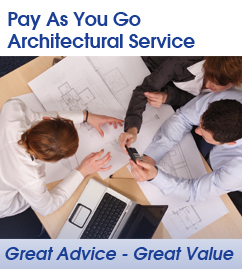 Your architect will outline the full range of services he can offer, and you decide what your particular needs are. You may select a reduced service and maybe only take ideas and advice and then proceed without the architects further involvement. Planning to build a new home or to extend? Why not avail of our newly introduced service, half day consultation to advise on your design. We will advise on internal layout of plans already prepared and make appropriate suggestions with regard to all relevant issues, orientation, sustainable design, energy management heating systems etc. Where the design has not advanced, we will advise on layout orientation, planning issues etc. and the sustainable design options available to you. For a fixed fee of €400 + vat, with no further obligations. Many house improvements do not require planning permission, your architect will advise.